Good points. 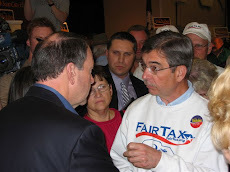 The combination of a strong FairTax Candidate with the emotional and popular support of the FairTax by the voters is the only chance The FairTax has. They have to maintain the 51% voting block. Good analysis, and quite different from the official "Reflections" found on the Fairtax website. 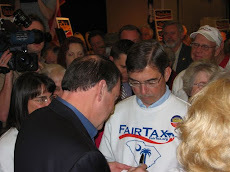 Larry K doesn't even support the Fairtax anymore, and his Purple tax reform proposal is quite a bit worse than the Fairtax, imho. Rather than trudging along and trying to push a wet noodle uphill, is anyone ready to try a simpler approach? If you really want to get rid of the hated income tax, it can be done with a 10% consumption tax as long as you leave FICA alone, leave gift/estate taxes in place, target the prebate at around the same cost as the EITC, forget about any inventory tax credits, don't tax governments, and phase it in over five years or so. I call it Fairtax-Lite, and it draws on many criticisms developed over the last five years. If you believe we should walk before running, than Lite might appeal to you.